BLOOM: A Story of Fashion Designer Elsa Schiaparelli with words by Kyo Maclear and pictures by Julia Morstad is a uniquely-told and splendidly-illustrated picture book biography for children 6-9 years of age. Schiaparelli, born in Rome in 1890, tells her own story in first person inviting the reader to be by her side as she realizes when she was born her parents really wanted a boy and they thought her appearance very plain when compared to her pretty older sister. Her dear Uncle Giovanni, however, encouraged her to bloom by calling her beautiful. The illustrations in this book, rendered in liquid watercolor, gouache and pencil crayons, energetically capture the essence of what Schiaparelli created. The illustrations are eye-popping! The back material includes notes from both the author and the illustrator plus more delightful pictures and a photo of the designer. 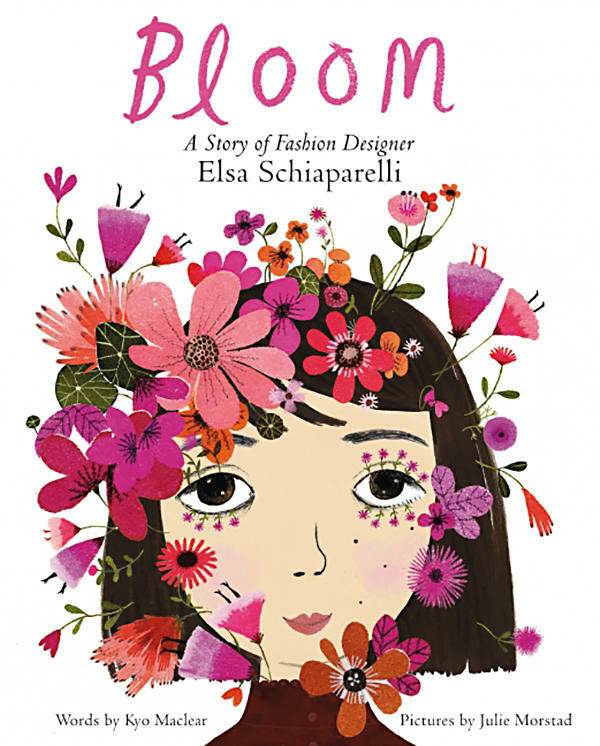 BLOOM: A Story of Fashion Designer Elsa Schiaparelli with words by Kyo Maclear and pictures by Julie Morstad is a beautiful picture book biography about creativity and the imagination for children 6-9 years of age (Harper Collins Children’s Books, 2018). Elsa Schiaparelli was known to design many whimsical things such as a hat made out of a high heeled shoe. Read A Note from the Author and the Illustrator at the back of the book to review some of her comical designs such as a hat in the shape of a lamb chop! Use your imagination and design a funny hat. Look all around the house for materials such as boxes, bags, towels and pillows with which to shape your hat and bits and pieces of things such as lace, yarn, ribbons, buttons, macaroni and fruit with which to decorate your hat. Have fun! This book states that as a girl Elsa saw beauty everywhere. Take a walk around outside and look for things that you think are beautiful including flowers, trees, birds, leaves, dogs, cats, clouds, shapes of buildings, colors and gardens. Make a list of the beautiful things you see and how they each made you feel. Hot pink was Elsa’s favorite color. She worked with a chemist to get the most vibrant pink possible. Look at the description in the book. What is your favorite color? How would you describe it? Why is it your favorite?